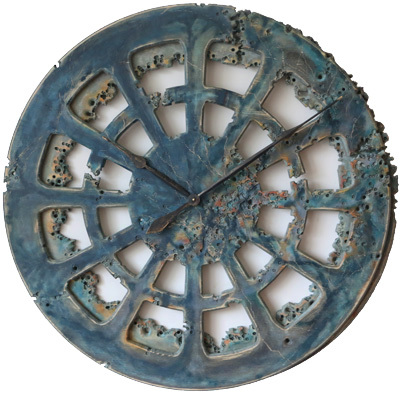 The most remarkable designer clock handmade from wood and hand painted in deep blue colours. If you want to provide the perfect “wow” effect on your friends and visitors treat yourself with this breathtaking piece of art. 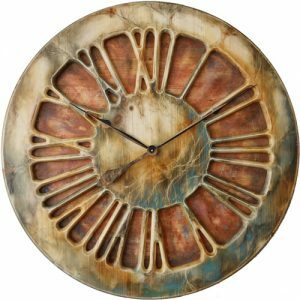 This beautiful designer clock has been inspired by the richness of the under sea world, its vibrant colours and abundance of form of life. The deep blue tones of the front face are complimented by lavish hues of orange and yellows. The back rim has more delicate colours to highlight the foreground. The skeleton form and lush ornamentation provide subtle yet exotic feel to this unprecedented design. 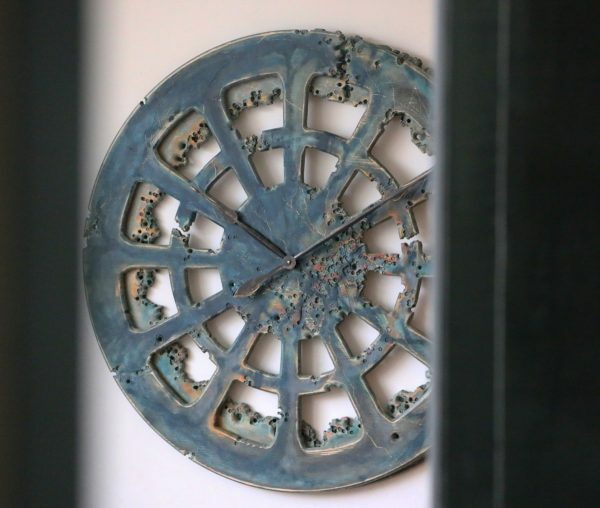 We have handcrafted this clock from two large panels of pine wood. 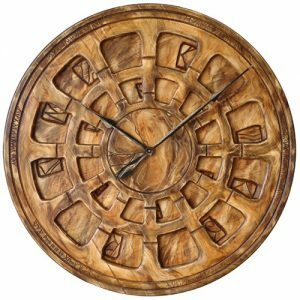 Most big clocks you can find online aren’t wooden. In 90% of cases you will find that other companies are using cheap MDF. “Deep Blue” on the other hand shows substantial wooden construction with three dimensional look. We achieved the most stylish colouring using wood dyes and non-toxic paints. Wax polish provides soft sheen and finishing touch to the whole piece. Due to its handmade nature and sophisticated design this remarkable timepiece is one of its kind. It’s individual personality and high quality is a feature that everyone is looking for today. The clock mechanism is the most powerful on the market. It requires a single C-Cell battery that will last 9 months or more. When you receive the clock all you need to do is attach both hands, set the time and put it on the wall. We strongly advice using 2 bolts and the wall that can support 15 kg of weight. Please avoid direct heat or moisture sources which could reduce the life of the mechanism. “Deep Blue” isn’t just a time telling device but its the most extraordinary piece of art. It would infuse your interiors with charisma and vibrancy. The unique design and beauty makes it a perfect choice for those who are looking for an exclusive centrepiece. In addition to that, its skeleton design makes it look three dimensional and fit many different interiors regardless of the wall colour. Please join our Facebook Community to share your views and comments. 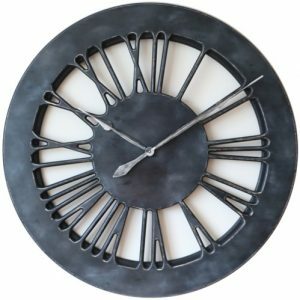 If you select any designer clock from Peak Art you don’t need to compromise on style and uniqueness anymore. 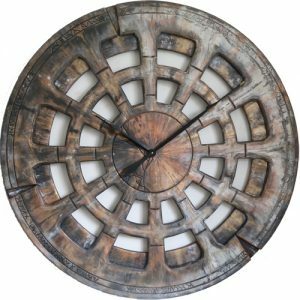 We are the new online business that is making massive statement timepieces from large panels of pine wood. 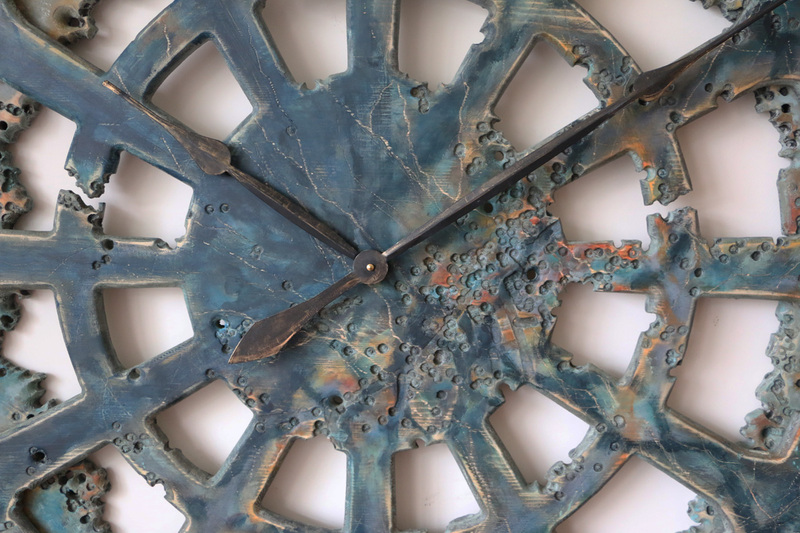 Every single clock from our collection has its individual features and character due to handmade nature of work. While the original design of “Deep Blue” measures 40″ (100 cm) we can now also make it smaller – 30″ or bigger – 48″ depending on the available wall space. 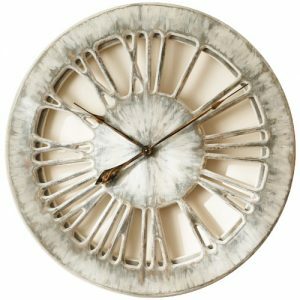 Of course, it won’t look identical when you place the back-order but that is exactly what differentiates Peak Art statement clocks from all other companies. 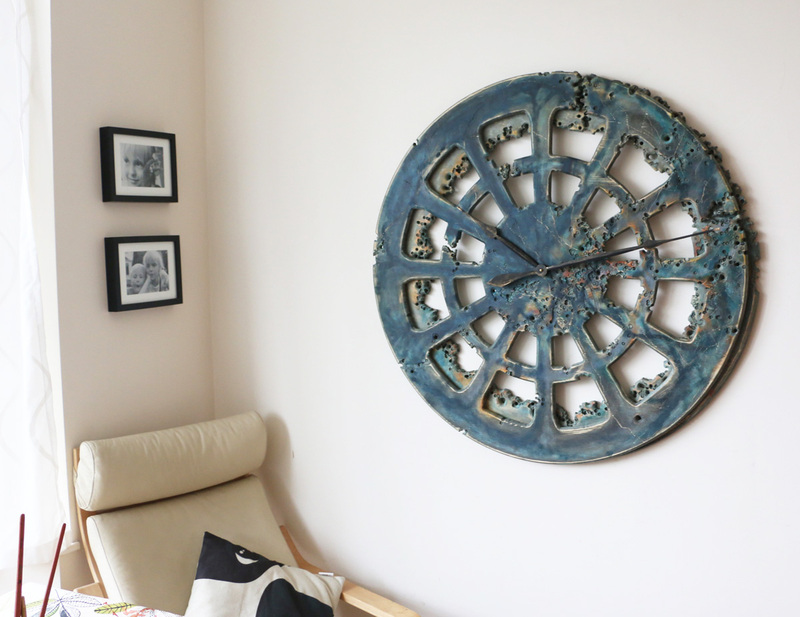 There is another similar wall clock in our collection and if you give us a call we can make a different variation just for you!